We’re proud to introduce an evocative design inspired by the female form created to celebrate and thank the YWCA. For for 100 years, the YWCA has been dedicated to eliminating racism, empowering women and promoting peace, justice, freedom and dignity for all. Learn more below or hear it from the source at www.ywca.org. YWCA USA is on a mission to eliminate racism, empower women, stand up for social justice, help families, and strengthen communities. They are one of the oldest and largest women’s organizations in the nation, serving over 2 million women, girls, and their families. Through advocacy and local programming, they create real change for women, families, and communities. The YWCA has 225 associations and serves more than 2 million women, girls, and their families in the United States. They are also part of an international movement serving 25 million worldwide in 120 countries. 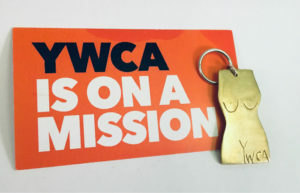 Each year, YWCAs help more than 535,000 women with safety services, which include sexual assault programs, domestic violence services such as emergency shelter, crisis hotlines, counseling and court assistance, and other community safety programs. They also help more than 122,000 women with economic empowerment programs, and more than 160,000 individuals participate each year in racial justice education and training programs. A Nice World is so grateful for this work and honored to serve the cause with this custom design. Available here and at the YWCA boutique in Tucson, Arizona. Individual online sales generate a minimum of 33% donated. Purchase a discounted Nice Dozen (14) for a personal fundraiser to generate 66% or more for your local YWCA. Posted in Nice Partners, Nice Sisterhood.